Praxair Inc is a New York Stock Exchange-listed company (PX) which is involved in the chemicals. It was founded in 1907, and is headquartered in Danbury Connecticut. The company’s chief executive officer, chairman and president is Steve Angel. Its 2013 revenues were listed at US $12 billion and the company is primarily focused on industrial gases. It supplies high-performance coatings, specialty gases, atmospheric and process gases to companies around the world. 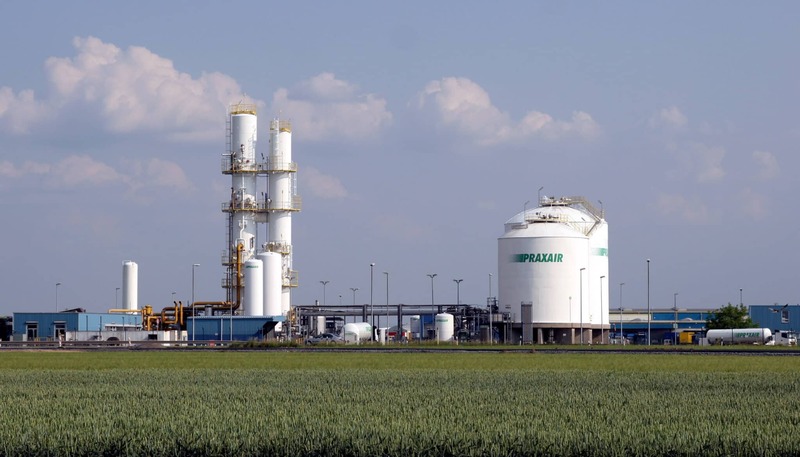 Praxair Inc is also the biggest industrial gases company in South America and North America, and one of the biggest around the world. It employs 27,000 people across 50 countries. The company is focused on enhancing global productivity and making everyday life easier. For over 100 years, Praxair Inc has designed ways and means of using air to generate more efficient manufacturing processes, and to allow for cleaner operations of manufacturing plants, among others. Praxair Inc is involved in both the construction and engineering of non-cryogenic and cryogenic supply systems. It is also involved in technologies to help consumers increase energy efficiency, lower operating costs and boost overall environmental performance. The specialty gases and process applications that the company is involved with include semiconductor process gases, carbon dioxide, hydrogen, helium and acetylene. In terms of atmospheric gases, emphasis is placed on the condensation, distillation, compression and cooling of gases such as argon, oxygen and nitrogen. Praxair Inc has regularly received high rankings from Newsweek magazine. In the Global 500 Newsweek Green Rankings, it was voted #52 from 500 companies, and #30 among the world’s greenest companies. Other accolades include CR Magazine’s Best Corporate Citizens, and it is also the lone American chemical company to be listed on the Dow Jones World Sustainability Index for 11 consecutive years. The name is derived from the Greek word ‘Praxis’ meaning application and ‘Air’ as a naturally occurring raw material. Praxair Inc caters to multiple industries including manufacturing, aerospace, electronics, chemicals, food and beverage, metals and healthcare. It was North America’s first company to monetize cryogenically separated oxygen and it was responsible for introducing liquid gas back in 1917. By the 1960s, the company used non-cryogenic separation techniques. Praxair Inc (NYSE: PX) has a market cap of $36.69 billion (October 2014), with a 52 week low price of $117.54 and 52 week high price of $135.24. Revenues from 2013 topped $11.925 billion, up from $11.224 billion in 2012, and $11.252 billion in 2011. In terms of overall performance over the past 5 years, Praxair Inc is at the top of its cycle, with strong growth beginning in March 2003 ($28.18 per share) and growing rapidly to its present price of $125.62 per share. The share price has consistently been above $120 since October 2013. The company’s price-earnings ratio is a respectable 20.19, and earnings per share are 6.16.